Over the past few months, there has been a flurry of announcements from private spacecraft companies about their plans for reusable spacecraft. Their ambitious ideas to recover rockets, install new orbiting infrastructure, and maximize payload space reveal an optimistic and exciting vision of how space exploration could evolve in the post-Space Shuttle era. If these companies achieve what they propose, we might actually start to see the broader access to space we've been promised thanks to reduced costs and faster turnaround between launches. And if these plans don't work out, we will at least get to watch some monumentally expensive failures. Elon Musk's SpaceX has been working diligently to perfect a reusable rocket booster that lands vertically on an "autonomous spaceport drone ship." The team has made three increasingly encouraging attempts since January 2015. In mid-April, the company's Falcon 9 rocket briefly landed on the ocean barge named "Just Read the Instructions" before excess lateral velocity caused it to tip over and explode. Previous failures in January and February were due to stabilizing grid fins running out of hydraulic fluid and the barge having to leave the landing spot due to rough seas, respectively. SpaceX already introduced its reusable Dragon V2 crew capsule last May, which uses eight thrusters to land with the precision of a helicopter, the company says. This combined with ambitions to routinely land Dragon 9 boosters on land would drastically reduce the time and resources for a new launch, requiring only inspection, refueling and a new second stage booster. Eventually, SpaceX hopes to recover both stages of the rocket, as depicted in this enthusiastic animation from January 2015 of its Falcon Heavy rocket, set to debut later this year. As Musk said last month, "if one can figure out how to effectively reuse rockets just like airplanes, the cost of access to space will be reduced by as much as a factor of a hundred." We'll see how quickly Musk can figure this out when SpaceX makes its next landing attempt in June 2015. Amazon.com founder Jeff Bezos's space transportation company is similarly developing VTVL technology for reusable spacecraft. Its first foray into this approach is its New Shepard suborbital spacecraft—named for Alan Shepard, the first American in space—which will eventually provide "reasonably priced" 10-15 minute suborbital space tourism and research flights (the cost has not yet been announced, but registration is open). Blue Origin completed a successful low altitude flight of its prototype VTVL propulsion system in June 2011, though an ensuing August 2011 test flight that reached an altitude of 45,000 feet failed when ground control lost contact with the craft. In early April, Blue Origin announced that it has completed acceptance testing of its new BE-3 liquid hydrogen rocket engine, which currently powers the New Shepard. A few weeks later, Blue Origin completed its first test flight of the New Shepard with partial success. The official press release states that the "BE-3 engine worked flawlessly," and that "any astronauts on board would have had a very nice journey into space and a smooth return." The vertical landing, however, was a failure, as the first stage lost pressure in its hydraulic system on descent, resulting in a surely fantastic crash in remote Texas, where Blue Origin's launch site is located. The company is also developing the BE-4 engine, which burns oxygen and liquefied natural gas, part of its long term ambition to build orbital launch vehicle capabilities. Bezos's fascination with recovering rocket engines has led him to the ends of the Earth, or rather the depths of the sea. In 2013, he financed an expedition to recover the sunken remains of the massive F-1 engines of the first stage of the Saturn V rocket, which powered the Apollo missions. The odds were against him as he disobeyed a ton of sailing superstitions on the mission in the Bermuda Triangle, but the expedition did manage to pull a bunch of old NASA metal three miles up from the sea floor—including Bezos's holy grail, an engine from the Apollo 11 mission that landed man to the moon and launched his passion for space and exploration. SpaceX's hottest competition is United Launch Alliance (ULA), owned jointly by Boeing and Lockheed Martin. On April 13, the same day as SpaceX was scheduled to make its third Falcon 9 launch and landing attempt, ULA tried to steal the show by announcing its plans for its Next Generation Launch System, named Vulcan. ULA's reusability strategy is focused on minimizing costs, not materials. As ULA President Tony Bruno told Spaceflight Now, "what something weighs drives how hard it is and how expensive it is to recover. As it turns out, things that weigh the most are not the things most valuable on the rocket. […] Maybe reusability does not start with entire stages, but there are things on it that are expensive and not that hard to get back and a lot easier to reuse a number of times." The manifestation of this is the Sensible Modular Autonomous Return Technology initiative, or SMART. After the first stage is jettisoned, the engine assembly detaches from the rest of the booster—largely just an empty fuel tank—and re-enters the atmosphere using an inflatable heat shield. After a parachute deploys, the engine is captured by a Chinook helicopter, ensuring safe delivery to the ground. In other words, there's a mid-air skyhook. The Vulcan's design brings another innovation in reusability. ULA is developing a second stage called the Advanced Cryogenic Evolved Stage (ACES), which features an internal combustion engine that Spaceflight Now reports is being designed with the help of engineers from top NASCAR team Roush Fenway Racing that recycles waste propellants to re-pressurize the stage's tanks, generate electrical power, and provide control and attitude thrust. "This is the ultimate in reuse," said Bruno. "The thing that limits the performance of the upper stage systems in launch vehicles is time—time in space." This new engine will extend the usability of the second stage from hours to weeks, and means the Vulcan could be used to deliver payloads to different altitudes or various orbiting spacecraft, or to orbit the Earth as a tanker for other vehicles to refuel. This also opens up the possibility of what ULA calls "distributed launch," where multiple launches put fuel, supplies, and eventually crew into space. All the pieces can then be assembled in orbit for longer missions. "We can go out and tap resources that are in space," said Bruno at a press conference earlier this year. "We can asteroid mine and then build the infrastructure for a real and permanent human presence. ULA aims to launch the Vulcan in 2019, but the SMART initiative and ACES won't come until later, as ULA is counting on income from initial launches to fund the research and development of these technologies. A handful of companies are also introducing new infrastructure that will make launches less costly and compact while offering substantial upgrades in logistics. Last month, Lockheed Martin, America's largest defense contractor, unveiled its proposal for a reusable orbital delivery system. It consists of the Jupiter reusable space servicing vehicle, aka "space tug," and the Exoliner disposable cargo container. With a tentative 2018 launch date, the Jupiter craft will remain in orbit, using its robotic arm to manipulate cheap and disposable Exoliner containers. Designed to meet commercial resupply needs of the International Space Station (ISS), Jupiter will capture Exoliner containers after launch and bring them over to the ISS. 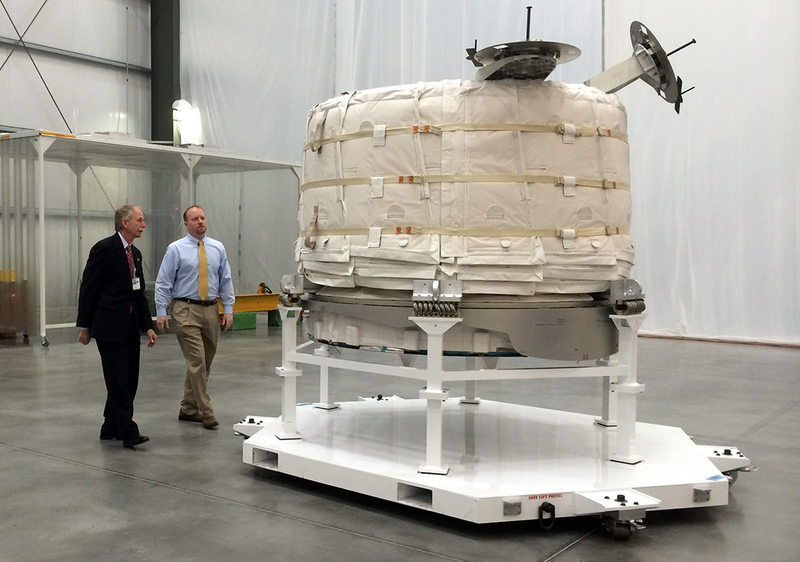 Supplies are removed by astronauts and the Exoliner remains attached as a storage unit for trash. The neat logistical trick of the operation is that disposal of the trash-filled Exoliner would be coordinated with the launch of a new one. As the second stage rocket arrives in space with new supplies, Jupiter drags the old container over, swaps the Exoliners, and returns to the ISS with fresh espresso and mousetronauts while the trash-laden rocket de-orbits and disintegrates. In its downtime, Jupiter can be used for other missions, such as deploying satellites. Additionally, while designed for a NASA request for ISS commercial resupply technology, the system has the flexibility to be adapted for deep space missions. Las Vegas-based space station company Bigelow Aerospace has an even more imminent project to improve living conditions in orbit and beyond. The company, which makes "expandable space habitats," received approval from NASA to supply the next ISS component: the Bigelow Expandable Activity Module (BEAM), which will be sent up later this year and remain attached for at least two years. The value proposition of expandable habitats is immense, as they are far less cumbersome and expensive to install than traditional all-metal habitats. The BEAM, which packs up to just 8 feet wide, will add 565 cubic feet to the space station when deployed. Bigelow Aerospace has a few other tricks up its sleeve for the future. The BA330 is an expandable structure that will provide 11,665 cubic feet will support a crew of up to six as a standalone space station, and can also be mated with other spacecraft, and its big brother is the Olympus module, which expands to 79,548 cubic feet. These easily transported and deployed units could be used in the future as standalone or components of space stations, habitats for the Moon and other planets, and more. If even some of the technologies described above are successful, it will make space accessible to mid-size companies, research institutions, and wealthy private individuals, and "that's a game changer," Bigelow executive Mike Gold told the Economist. "When the laser was first invented, no one had any idea what it might be used for. Today they're everywhere. We're still at that early stage with cheap rockets." What's at stake? An massive new space economy is on the horizon. As Bob Richard, CEO of Moon Express, told Motherboard last year, "I think the first trillionaires will actually be made by investment in space resources."